Although I’ve been taking a photo a day, I have been orbiting the planet of bliss too closely to post them. So here comes the first in a series of catch-up posts. And look! It’s a flower! Well, not just any flower. 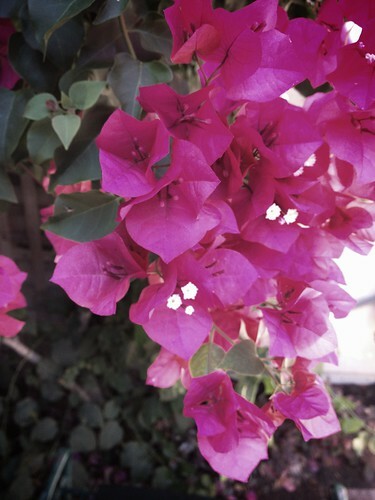 Bougainvillea is one of my favourites. This one blooms outside my in-laws’ lovely home in Marin. I know it grows lots of places, but I associate it with the Bay Area. Its colour is much too saturated for my little phone to capture properly. Also, its name has many more vowels than I realised until I looked it up for this post. The more you know!